Please accept my blessings. 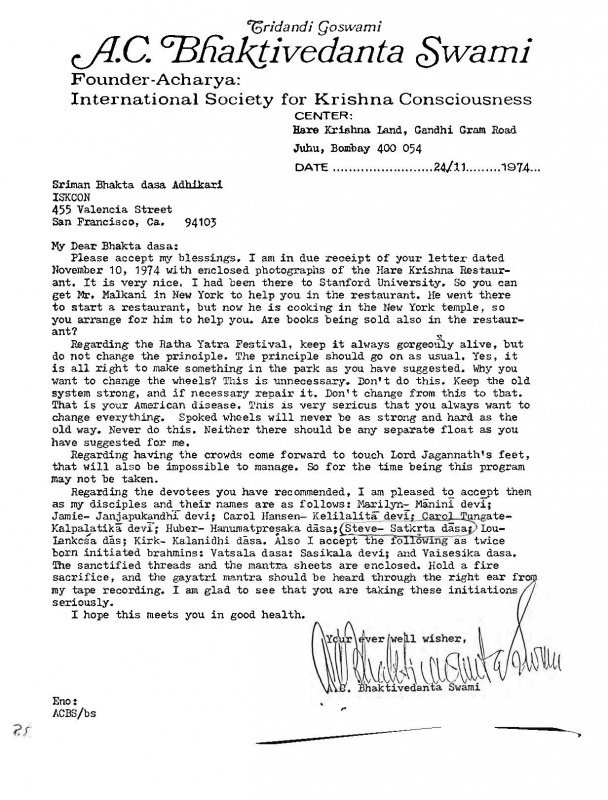 I am in due receipt of your letter dated November 10, 1974 with enclosed photographs of the Hare Krishna Restaurant. It is very nice. I had been there to Stanford University. So you can get Mr. Malkani in New York to help you in the restaurant. He went there to start a restaurant, but now he is cooking in the New York temple, so you arrange for him to help you. Are books being sold also in the restaurant? Regarding the Ratha Yatra Festival, keep it always gorgeously alive, but do not change the principle. The principle should go on as usual. Yes, it is all right to make something in the park as you have suggested. Why you want to change the wheels? This is unnecessary. Don't do this. Keep the old system strong, and if necessary repair it. Don't change from this to that. That is your American disease. This is very serious that you always want to change everything. Spoked wheels will never be as strong and hard as the old way. Never do this. Neither there should be any separate float as you have suggested for me. Regarding having the crowds come forward to touch Lord Jagannatha's feet, that will also be impossible to manage. So for the time being this program may not be taken. Regarding the devotees you have recommended, I am pleased to accept them as my disciples and their names are as follows: Marilyn—Manini devi; Jamie—Janjapukandhi devi; Carol Hansen—Kelilalita devi; Carol Tungate—Kalpalatika devi; Huber—Hanumatpresaka dasa; Steve—Satkrta dasa; Lou—Lankesa das; Kirk—Kalanidhi dasa. Also I accept the following as twice born initiated brahmanas: Vatsala dasa; Sasikhala devi; and Vaisesikha dasa. The sanctified threads and the mantra sheets are enclosed. Hold a fire sacrifice, and the gayatri mantra should be heard through the right ear from my tape recording. I am glad to see that you are taking these initiations seriously. This page was last modified on 23 August 2016, at 22:27.